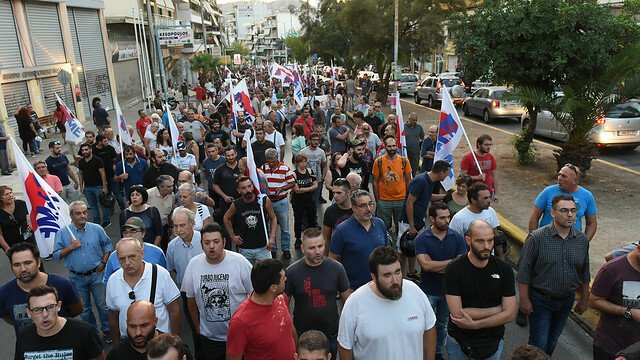 On the occasion of the five years since the assassination of the young musician Pavlos Fissas a massive mobilization was carried out by trade unions and mass organizations of Piraeus on Tuesday 18/9/18, in Keratsini, at the site of his murder. "Today, September 18th, we mark five years since the day that Pavlos Fissas was murdered by the Nazi criminal organization, the Golden Dawn. We are here today to honor his memory, but also to send the message, over and over again to all those who want to terrorize the working class, to break it, to squeeze whatever it can get from it, to immobilize it and profit from it, that their dream will never come true. As long as there is a class-oriented labor movement, as long as there is exploitation, the workers will always defeat fear, they will respond to the attack. This unprecedented in brutality criminal act is part of a collective, organized and guided action by central, regional and local bodies, resulting in death, injuries, attempted murders and other offenses. A few days after the murderous ambush planned by the Nazi gang against trade unionist communists in the ship repair zone of Perama, taking on as the true child of the exploitative system the dirtiest work against workers'-popular rights and building a wall of protection for employers' profits, they murdered Pavlos Fissas. The workers need to draw clear conclusions. The fascists of the Golden Dawn are the system's bullies, they are enemies of the workers, of our rights, of our struggles. They struggle to smash the class-oriented movement and this is what the big contractors, the shipowners, capital want. The only way forward is the organization of our struggle through PAME and the class-oriented trade unions. The experience of the metalworkers in the zone, the dockers in "COSCO" and elsewhere shows the way. Let's struggle to become the masters of our own labor. The workers, the unemployed must isolate the fascists, the Golden Dawn. So they won’t have any place to stand. " “Five years after the assassination of Pavlos Fissas, the trial – for this case, but also for their other crimes - has not yet been completed, and the Nazis of the Golden Dawn roam free despite the many overwhelming evidence which prove the Nazi-criminal character of this structure. All these years, it has become even more obvious to the people and the youth that such fascist reactionary forces are products of the rotten system whichutilizes them in various ways. They are encouraged by the EU anticommunist ideology and practice, supported by sections of the capital and imperialist centers which do not even hesitate to support such forces to promote their plans (e.g. Ukraine). Above all, these forces are utilized by the system so that dissatisfaction and anger from the anti-labor and anti-popular policy of the governments are trapped in racism and fascism, so that the real enemy is let off the hook.